Mango Mania is still continuing, today I came up with a recipe, that is sweet and sour in taste, simply delicious, rather luscious!! You can eat this with bread at breakfast, or as a snack or dessert. Yes, it’s called Mango Jam. It is so easy to make at home and surprisingly without much effort. 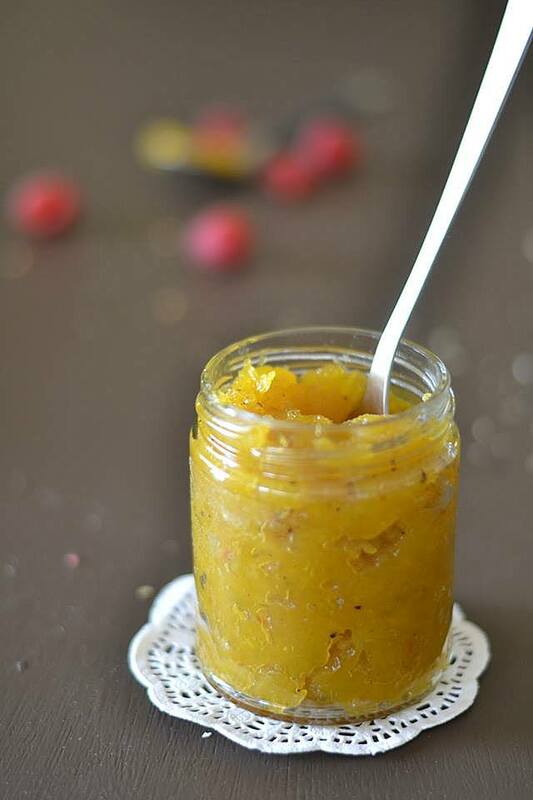 Last week I asked my hubby to bring some raw mangoes and I had a plan to make Raw Mango Chutney with the same. 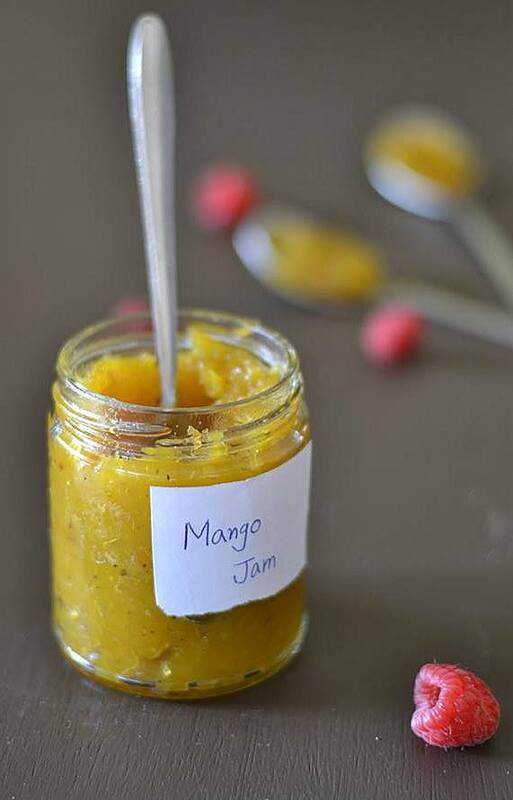 But he got some extra mangoes which I didn't need and it ended up with this yummy Mango Jam. I was planning to share the recipe of Raw Mango Chutney, but alas! I couldn't save anything to click its pictures. I don't want to blame anybody, I couldn't resist form relishing it. So from yesterday, I was very conscious that before taking any snap, I won’t have a single spoon. 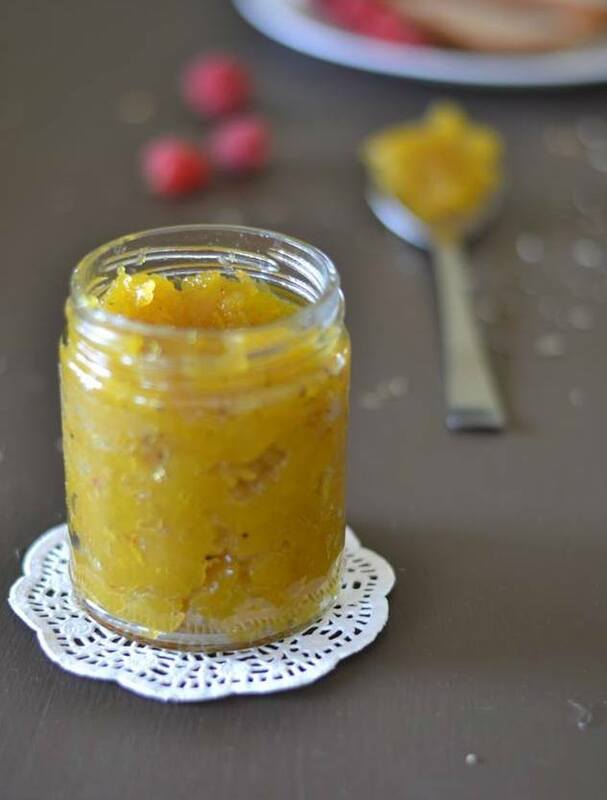 When I was in 7th grade in my school, I learnt how to make Mango Jam in our 'Work Education' class. We made this same Jam and but I couldn't remember the actual recipe. But thanks to Google, after reading many recipes, and from the taste that was still in my mind, I gave a try that came out exactly how I wanted. As such there are not many steps in the cooking method of this recipe. 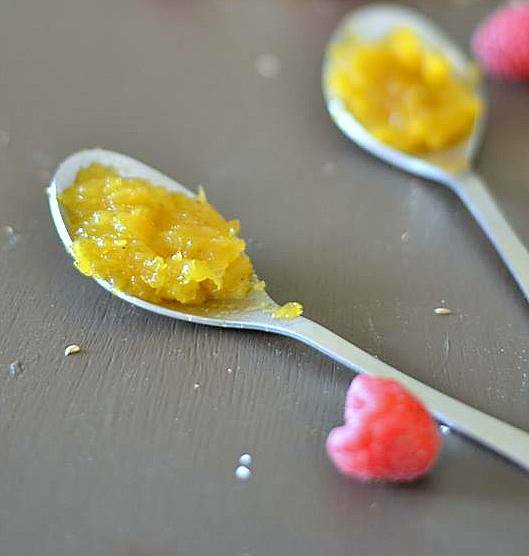 Get the mango pulp from some raw mango and cook with sugar. When it is almost done, add some lemon juice, that's all. I added a pinch of cardamom powder, because I like the combination of mango and cardamom powder. Then I added pinch of dry roasted spice powder for the spicy kick that you may skip. To get some stunning color, I added few strands of saffron. 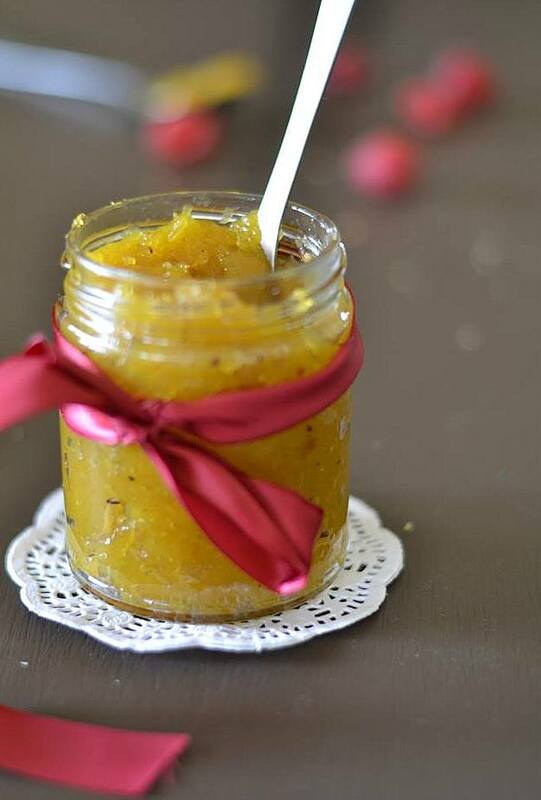 This dish is also known as Mango Murabba (Sweet mango relish/ Sweet mango pickle). 1. Wash, peel, grate the mango and set it aside. 2. Add sugar, cardamom powder and saffron to it. Mix it nicely and keep it aside for 10 minutes and so. In this time, the raw mango starts to release water. 3. Dry roast 1 tbsp of cumin seeds and a whole dry red chili till aroma comes up, then grind them into powder. This is called Dry Roasted Masala Powder. 4. Cook the Mango mixture in microwave for 3 to 4 minutes, take it out of microwave and stir it well. Put it back in microwave again for 3 minutes more. Check it in every one minute and give stirs, till you get desired consistency, check the sweetness. You may avoid the microwave method, by cooking it on the stove-top. 5. When it is done, add the lemon juice, mix it nicely and add the dry roasted masala powder combine with the mango. 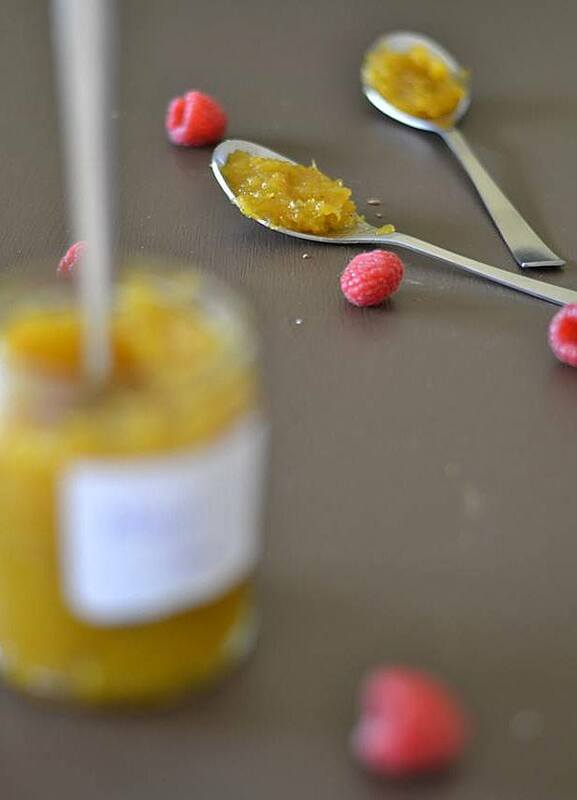 Mango Jam is ready. 6. 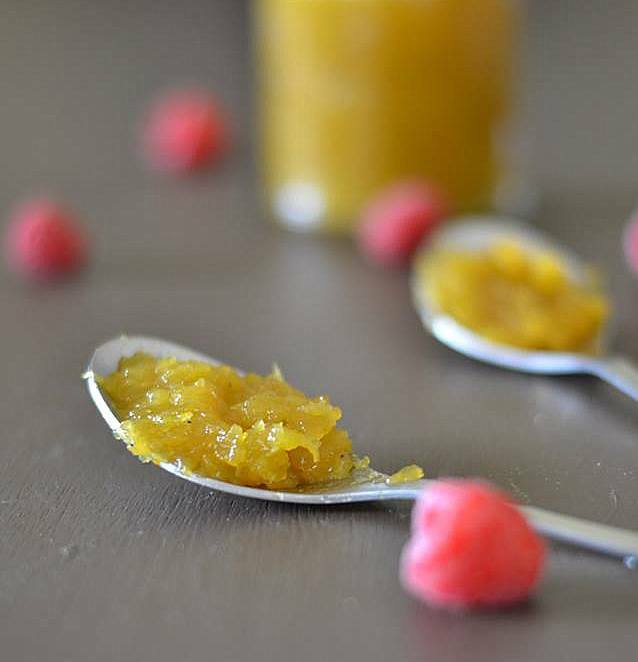 Allow it to cool down completely, then put it in a jar, you can store the Mango Jam for about a month at room temperature or 3 to 4 months if you keep it in refrigerator. © Mix-and-Stir. Powered by Blogger.